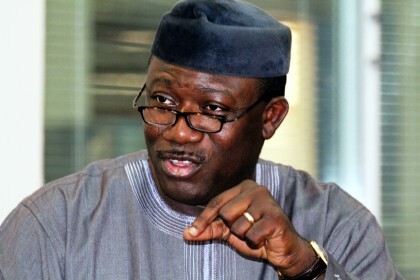 The Minister of Mines and Steel Development, Dr Kayode Fayemi has said that the revitalisation of the Aluminium Smelting Company of Nigeria (ALSCON) in Ikot-Abasi, Akwa Ibom State is crucial to the diversification plan of the Federal Government. Dr Fayemi disclosed this to journalists shortly after taking a tour of facilities in the plant reputed to be the biggest in Africa, said revitalising the plant would help the government’s import substitution strategy. Fayemi who undertook the tour of the various plants and the harbour in the complex win company with the Minister of State, Hon Abubakar Bawa bwari, lamented that the huge national asset was left to rot, in spite of its potential to help boost the economy and create employment opportunities. The Minister who was conducted round the complex by the Managing Director of RUSAL-ALSCON, Mr Dmitriy Zaviyalov, lauded the Russian company managing the complex for ensuring that the machines were kept in good shape despite the absence of production activities, occasioned by a legal tussle over ownership. He said government could not do anything about the legal tussle other than to encourage the Supreme Court to expedite action on the ruling which would free the complex of any encumbrances. He however said that government was fully prepared to tackle other administrative issues that might have crippled production processes at the plant once the legal aspect had been resolved. Specifically, he said the ministry was ready to assist the company in resolving all administrative issues it might have with some organisations including the Nigeria Export processing Authority (NEPZA), the Nigerian Gas Company and the Bureau of Public Enterprise (BPE) , in the bid to ensure that the plant comes alive again. The Minister said that contrary to reports that RUSAL was involved in asset stripping, the fact on ground showed that the Russian group had maintained the plants as well as a small work force, since it has stopped work. He said the power plant in the complex has the capacity to generate 540 mega watt, while all that the plant need to function was about 350 mega watt, thereby leaving it with an excess of about 200 mega watt, which can be fed into the national grid. The Minister said: “This is a government that believes in the rule of law, so we cannot influence the judiciary over the matter. But we will help to resolve all other administrative issues that may arise between the company and other organisations in the interest of our economy. “It is in our interest for the issues to be resolved. I am sure the Vice President, who is also the Chair of the Privatisation Council of Nigeria, would invite all the parties concerned once I brief him on my findings. “We cannot have such a huge national asset like ALSCON and allow it to go into ruins, and If privatisation must work, there must be sanctity of contractual agreement”, Fayemi added. He said the complex has the capacity to give about 2,000 direct employment and well over 10,000 indirect employment when put into use. The excess power it generates can serve Akwa Ibom and at least two other states. The Minister later paid a courtesy call on the traditional ruler of Ikot Abasi, His Royal Majesty, Edidem U.J Ntuk Obom XII, who also urged the federal government to do everything possible to ensure that ALSCON was revitalised, so that economic prosperity of the town could return.